*(c) 2010, Roger D. Hagood. 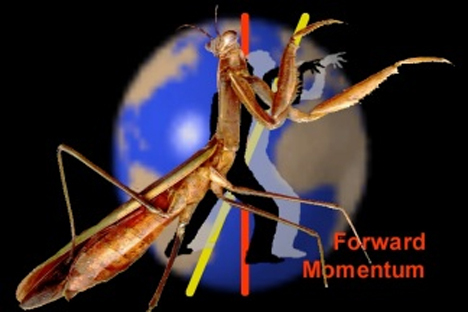 Southern mantis technique is based on a deep rooted firm upright stance, straight forward explosive force (of a sticky nature) and the use of turning or borrowing power with small deflective angles, circles and hooks. Practitioners emulate the mantis fighting posture by extending their hands forward, with the elbows slightly bent and tucked in close to protect the centerline - like a mantis. The feet are separated by the distance of about 18-24 inches, shoulder width apart, with the bent lead leg supporting most of the weight, while the slightly curved leg acts as a strut. A single movement of the arm may contain several actions. Tactical operations of the hand include grappling, catching, holding, capturing, clasping with the forearms, slicing strikes with the knuckles, pressing with the elbow, sudden quick pushes with both hands, spearing with extended fingers, flicking of the hands in quick jabs, exploding fingers from the fists, jerking the opponent's arm, slicing and chopping with the edge of the palm, hooking and deflecting hands, elbow strikes, claw-like raking actions, and poking with the back of the hands. Many of the movements are simultaneously defensive and offensive. The feet, ankles, knees and hips may mirror the hand movements. The principle of intent or "will-power" is first discussed. Intent may simply be defined as the 'warrior spirit." Without it, there is no focus of the body and mind into one purpose. Rooting and centering are next discussed. Rooting is the skill of developing the force of one thousand pounds in the feet. With it, the stance is as firm as Mt. Tai and not easily moved. Without it, the power of the fist will be stagnated in the chest and one's feet will not be steady. 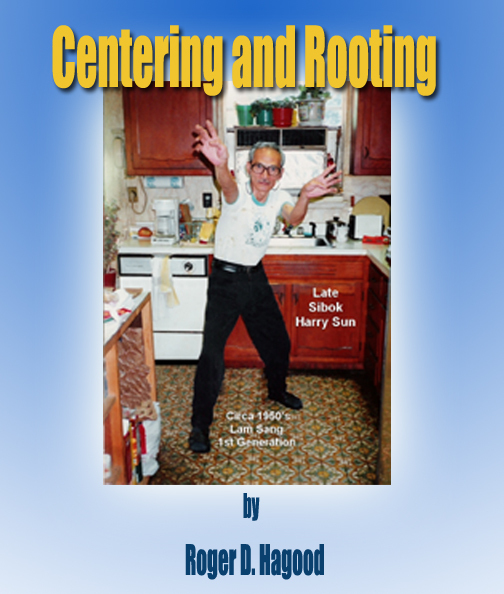 Centering is the development of the root. 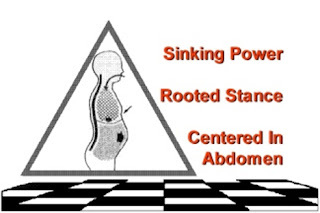 It is the lowering of the center of gravity within the body. It is accomplished by breathing and correct body structure. Body structure is a key element. Like a triangle, one must develop a base in relationship with the other parts. In the body it is a sinking power. If the stance is too wide, too narrow, too long or too short, the center will be unstable. Imagine an upside down triangle standing on its tip and you can see the slightest force will cause it to topple. 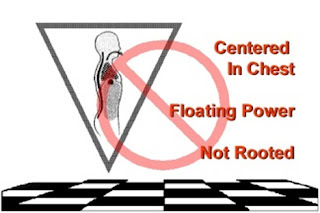 This is a floating center and should be avoided. Many styles mimic the movements of animals, but the Jook Lum Mantis is based on the structure of the human being. The practicer stands up-right with the feet firmly placed heel to toe 18-24 inches apart or slightly wider than shoulder width. Gathered through the feet and up the legs and back, the power is expressed in the hands. This produces a live springy power (action-reaction force in a sticky way). It is produced by the whole body in spiraling motions, as a spring is twisted and then released. It is the function of the hand and foot arriving at the target intently at the same time. There is a saying, "any deficiency of power in the hand, can be found in the root and center." 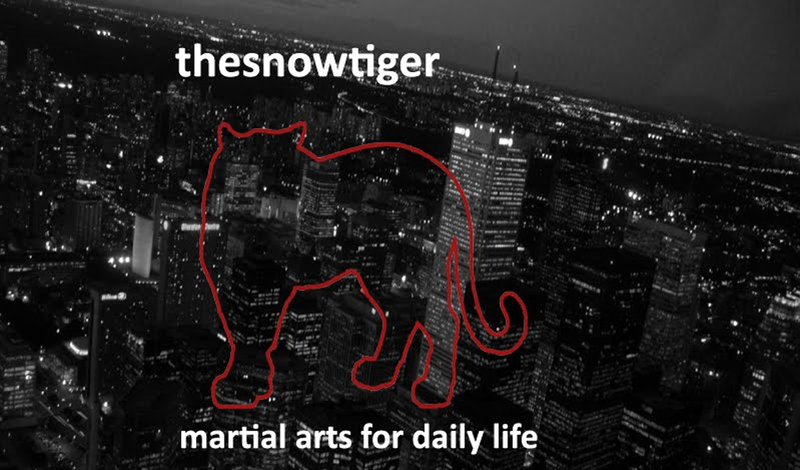 Being that the structure of this kungfu is based on the natural movements of man and the hand movements of a mantis, the style's form and function express themselves as one. How many times have we seen dozens of different stylists, all practicing their various forms, only to enter the fighting competition and become indistinguishable from each other? That is to say, that their form and function is not the same. Jook Lum Mantis is one style that exhibits form and function inseparably. Once found, one must learn to move the center while remaining stable in all positions. This is the function of stepping and is based on the body structure and the use of power in attack and defense with the feet, shins, knees and hips. Jook Lum has both linear and circular stepping such as three steps forward, four corners and eight directions. 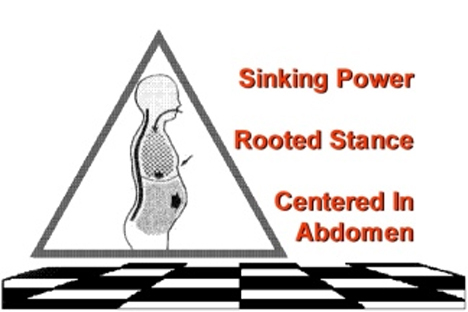 Once a rooted stance is developed and one is able to move the center of his body by stepping forcefully and aggressively without a break in the root, he may learn to "box" using the hand. When the stance is rooted and one can move the center, it is said the whole body has become a hand. The mantis arm is composed of three "hands;" from the shoulder to the elbow, from the elbow to the wrist and from the wrist to the fingertips. A good mantis will use his "second hand" for control by pressing the forearm into the centerline of his prey, at the same time striking a vital area with his "first" hand or fingers. Thus there is constant pressure on the opponents root and centerline and then a redirection and use of the opponents resisting force turned against him. The centered rooted posture must be expressed in a slight forward momentum to create a forward driving force in attack. One cannot maintain a chest upright posture, or a slight leaning back posture and produce full forward force. 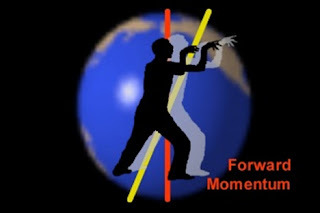 So a driving forward momentum, without over extending, is trained to produce full force. 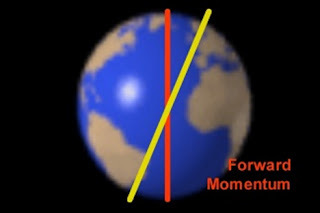 This forward momentum mimics the axis of the earth which is not upright but inclined on an approx. 15 degree inclination. I thank Roger D. Hagood for permission to reprint this important article. 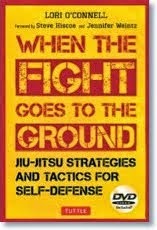 From a throw in Judo to a push hand technique in Tai Chi, centering and rooting are fundamental to all martial arts. Indeed, a simple punch cannot be executed without a sound structure beneath it.